The Summer of 1976 saw Mark Fidrych seemingly come out of nowhere to be a rookie sensation. His surprising success was mirrored in politics when an obscure, peanut farming governor ascended to the highest office in the land. President Jimmy Carter will occupy the Oval Office for approximately two months before the Seattle Mariners and Toronto Blue Jays take the field for the first time in April of ‘77. Starting in ’74, Topps began distributing all the cards in their base set at once (they did this in select markets in 1973), meaning there was no longer an opportunity to take photos in spring training and include them in later series. Therefore, all the Blue Jays and Mariners cards feature poorly rendered, airbrushed cap insignia. As a kid growing up in Washington State, it would be an understatement to say I was “stoked” at the prospect of Major League Baseball returning to Seattle. I certainly “lusted in my heart” at the prospect of collecting Mariners cards. I began purchasing-by mail-complete sets in ’74. Once my ’77 set arrived, I discovered that the first ever Mariner card was that of Tommy Smith. Who!? Tommy was a little used outfielder made available by the Indians in the expansion draft. The Mariners waited until the 58th pick to add him to the roster. Smith didn’t make the squad out of spring training but found his way to Seattle later in the season. After 21 games with the M’s, Tommy’s career in organized baseball ended. The first Blue Jay on a card was veteran Steve Hargan. Before an elbow injury in ’68, Steve appeared to be destined for greatness with Cleveland. An All-Star year in ’67 led to his inclusion in the ’68 Topps game insert subset. He’s easily the most obscure player in the set and was selected by Topps over teammates Sam McDowell and Luis Tiant. Picked in the 39th round of the expansion draft from Texas, Steve was the oldest pitcher on the Blue Jays roster. He was a Jay for only a short time before being dealt back to the Rangers on 5/9/77. Whether coincidence or not, Topps featured the two winningest pitchers for the Blue Jays and Mariners during the ’77 season as the first to debut their teams uniforms in the next year’s set. 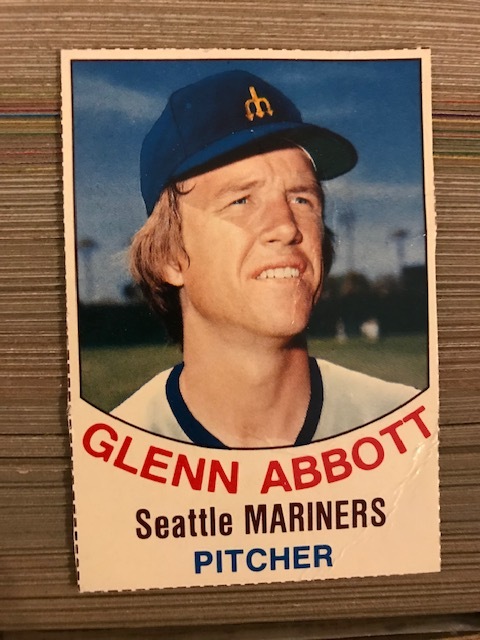 The “Tall Arkansan,” Glenn Abbott, won 13 games in the inaugural season for Seattle. He went on to be the M’s best starter in the early years. His fellow 13 game winner, Dave Lemanczyk, is the Blue Jays first card. Like Abbott, he will be a mainstay in Blue Jay rotation during the lean, expansion years. By the way, the ’77 set contains an error card for Mariner Dave Collins. He was first batter in Mariners history, leading off as the DH against Frank Tanana and the Angels. Of course, Dave struck out–thus launching me on a 40-year (ED: so far) “trail of tears” as a long-suffering Mariners fan. The photo on Dave’s card is that of his ’76 Angels teammate, Bob Jones. The O-Pee-Chee set has a correct photo (right, above) of Collins. Although you may need a six-pack of “Billy Beer” to wash away the memory of this post, I shall forge ahead with a look at the ’93 and ’97 expansion teams in a future post. Neither “killer” rabbits, vengeful Ayatollahs or a “malaise” can stop my quest. The 77 set also had no team pictures for the 2 new teams, putting their Team Checklists (which were normally on the back of the team pic) instead on the back of the Manager/Coaches card, which only existed for these two teams. Interesting! Not surprising, as Topps provided the photos for those Hostess sets. Mr. Jenkins you have inspired me to pull my 1978 set and take a look at all the Mariners and Blue Jays in their original uniforms!